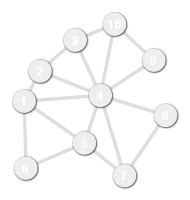 Finds connected components in a graph using iterated Breadth-First-Search (BFS). 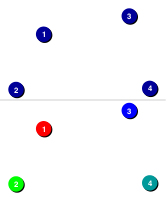 A recursive implementation of Depth-First-Search (DFS), which computes a DFS labeling. 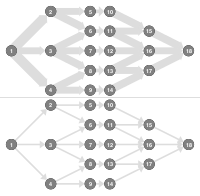 An iterative implementation of Breadth-First-Search (BFS), which computes a BFS labeling. 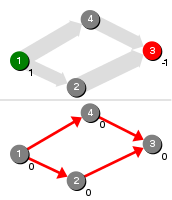 Converting the iterative BFS implementation to an iterative DFS implementation by exchanging the Queue for a Stack. 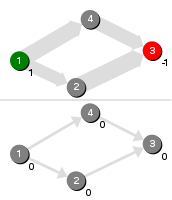 An iterative implementation of Depth-First-Search (DFS), which computes a DFS labeling. 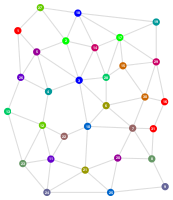 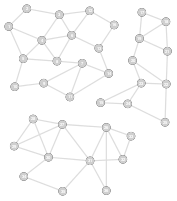 Kruskal's algorithm computes a minimum spanning tree in a connected, weighted graph. 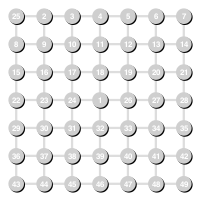 A more detailed, but naive implementation of Kruskal's algorithm, which checks for each edge to be added whether it completes a circuit. An improved, but still somewhat naive implementation of Kruskal's algorithm, which bypasses the explicit test for circuit completion by maintaining component labels for vertices and testing for equality. An efficient implementation of Kruskal's algorithm, which minimizes the number of component label updates. 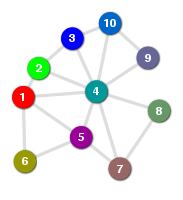 Prim's Algorithm computes a minimum spanning tree in a connected, weighted graph. 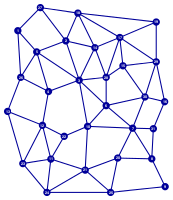 An implementation of a matroid dual of Kruskal's Algorithm. A primal dual version of Kruskal's Algorithm. Dijkstra's algorithm for finding a shortest path tree in a graph. 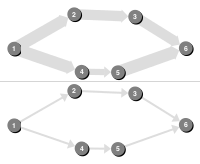 This is an example of a label setting algorithm. 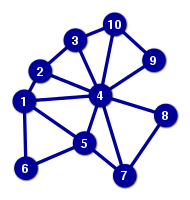 Dijkstra's algorithm for finding a shortest path tree in a graph implemented using a Priority Queue. 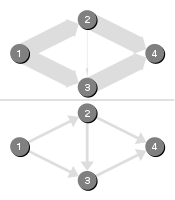 A variant of Dijkstra's algorithm for finding a shortest s-t path in a graph. 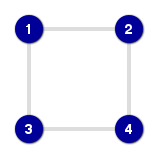 Terminates early, as soon as a shortest s-t path has been found. 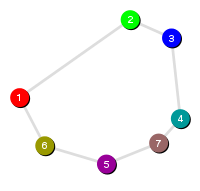 A variant of Dijkstra's algorithm for finding a shortest s-t path in an Euclidean graph (edge weights correspond to Euclidean distance between vertices). 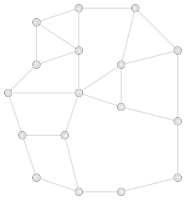 Terminates early, as soon as a shortest s-t path has been found and only visits a small part of the graph. Similar ideas are used in A*-type algorithms. 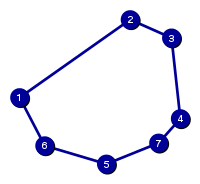 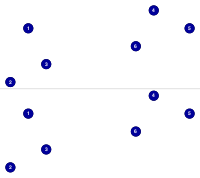 Bellman and Ford's algorithm for finding a shortest path tree in a graph with a label correcting approach. 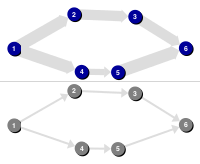 Most shortest path algorithms require that graphs do not have negative circuits. 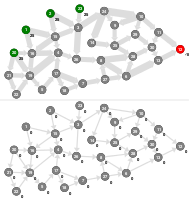 This algorithms detects negative circuits in a graph. 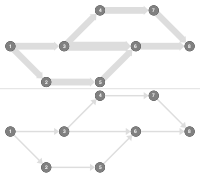 Finding a path can be accelerated by searching from start and destination simultaneously. 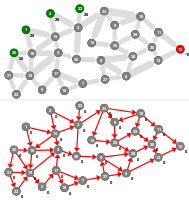 The Ford-Fulkerson algorithm finds a maximal flow in a capacitated network by successive shortest path applications. 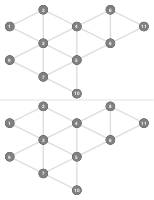 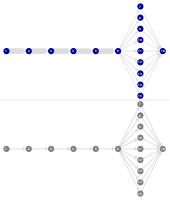 The Preflow Push algorithm due to Goldberg and Tarjan computes a maximal flow by saturating a network and correcting possible excesses later. The Negative Cycle Canceling algorithm establishes a maximal flow and reduces costs by finding negative circuits. 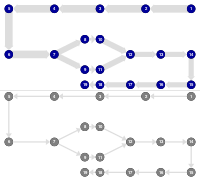 This algorithm finds a minimum cost flow by repeatedly finding shortest, augmenting paths. 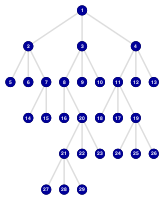 The cost scaling algorithm directly operates on the bits of the cost function. 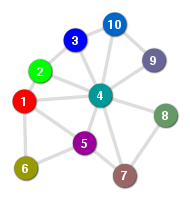 This algorithm finds a maximal cardinality matching in a bipartite graph. 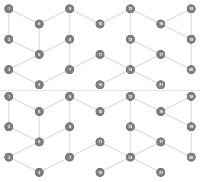 In other words it maximizes the number of matched vertices. 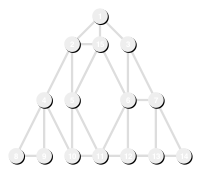 This algorithm finds a maximal cardinality matching in graphs which are not necessarily bipartite.